See my new YouTube MMD video "She's So Hot!" … features the “Reggie’s Evil Eye” effect! I just posted my “She’s So Hot!” MMD video! I created it as a way to demonstrate the new MME “Reggie’s Evil Eye” effect. From “start” to first animation-test-video took me only about two hours. I started with creating the soundtrack … and then animated against the soundtrack. 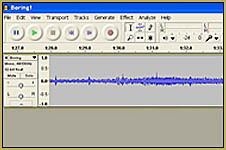 I opened my Audacity program, plugged-in my microphone, and sat there for a few minutes as I dreamed-up my script. All I knew was that I wanted something funny, with a little something to embarrass Miku, so that I could show her face through the Evil Eye mask. … After babbling into the microphone for a bit, I hit upon the scenario that you see in the finished piece. I recorded it on two tracks … for Kaito and Len … edited my recording a little by moving elements of the sound within the tracks and adjusting the pitch for Len’s voice. I also added three more tracks of gentle laughter at the end, thinking that I might have several more characters in the scene … I used the laughter, but did not add the other models. I finally did a “Mix and Render” as mono to get a single track for Export to WAV file. … I started-in on the animation. 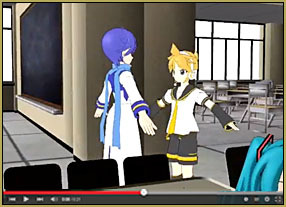 I loaded the “MMD Inside of School” stage. Thanks to Google Skecthup, I already had a cafeteria-table-with-chairs model. I also had just the table … and just the chair. I mounted the stage to a Dummy Bone and slid the stage to bring the room that I wanted to use to be centered with the center of the coordinate grid … turned off the grid … loaded my props, mounting them to dummy bones and sliding them into position in the room. 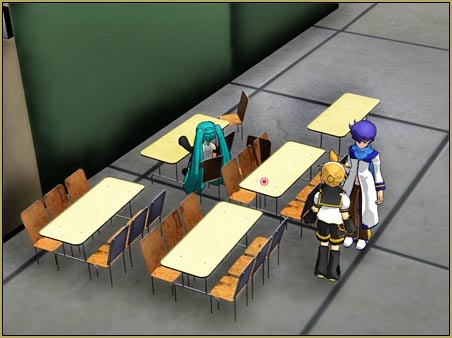 I loaded Miku and placed her into a chair, facing away from the boys. I loaded and positioned the boys. … you can see in the video that almost all of it was cropped-out of the scene! You catch a quick glimpse of it as the camera swings around … but mostly, I could have had a more simple set. With the stage set, I made an attempt to “do” the camerawork. That was fun! Working against the soundtrack, with MMD set for “Play WAV with Frame”, I zoomed in on the faces at the critical moments … and moved to give us the view that shows Miku had her back to the boys … and the boys didn’t know she was there. I spent some time trying to adjust the overhead lights … I found that the tight confines of the room I was shooting in made shadows pop-up all over the place. In the end, I had to toss-up my hands and “let it be.” … not happy with the light and shadows. I especially enjoyed that moment of camerawork near the end of the animation when Kaito says “She thinks she’s so hot …” … You hear Len say “Yahhh” … then the camera swings to see Len’s face … you expect him to say something … the scene suddenly cuts to Kaito as he says “… but she’s not!” and we cut to Miku’s face during the laughter. Fun stuff! I carefully worked on getting Kaito to mouth his whole speech … start to finish … and then did Len’s too … only to realize that I had wasted my time. Their flapping lips are only rarely on-camera … so all of that lip-sync animation was for naught! … (it must have been good practice “:o). I worked to put nice body-language on the models and worked to get some expression into their faces. That was tough! These basic Animasa models have very limited facial expressions! Len doesn’t even have a Grin! … and Miku always looks pleasant … it was tough to get her to “burn” for that last shot! 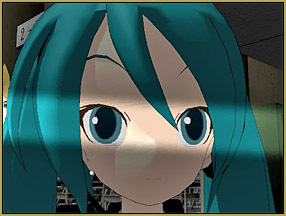 The last step was to adjust the camerawork for the proper “linger” time on Miku as she is shocked by what she hears. I added the Evil Eye effect to get that anime-style shading that gives you that “look of being shocked”. I added the Skydome from the MMD Batokin Island stage set so that “something” would be outside the windows … and I added the SASO_lite effect to add color-depth and shadows. I did a Render to AVI using the Cinepak Codec by Radius compression setting. The new video was fun to watch … I must’ve watched it fifteen times, laughing each time, before I uploaded it to YouTube. Then I watched it another ten or fifteen times!